Congratulations to the students of Oconee County Schools! The 2012 SAT scores are in and Oconee County is once again leading the way. The state of Georgia boasts nearly 180 school systems. 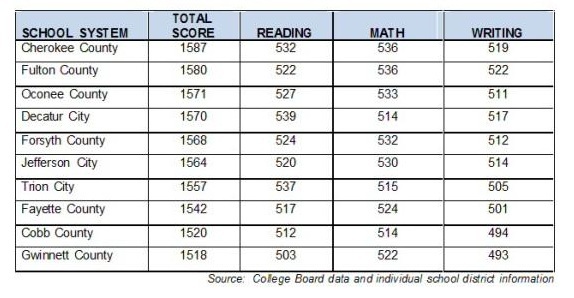 The scores of our students placed Oconee County with the third highest SAT achievement in the state among all districts regardless of size, and first among districts with 35,000 students or less. In addition to our outstanding system achievement, our two high schools also received recognition as both student bodies placed in the top 50 out of over 400 high schools. Oconee County High School ranked 42nd with a composite score of 1551 and North Oconee High School ranked 27th with a composite score of 1590. The total SAT score of 1571 for our system outperformed both the state and national averages. (The state of Georgia’s average composite score was 1452 and the national average came in at 1498.) This achievement continues a trend that has seen OCS students outperform the state and national average dating back to at least 2006. This report reflects high school graduates in the year 2012 and the information is summarized for seniors who took the SAT at any time during their high school years through June 2012. Previously, only scores through March of each year were released. The SAT is a college entrance exam developed and administered by The College Board. It was designed to test the subject matter learned by students in high school and the critical thinking skills necessary to succeed in college. The test has three sections – critical reading, mathematics, and writing – each worth 800 points for a highest possible score of 2400.